The DLSAA Br. Benedict Award aims to perpetuate the memory of Br. Josiah Benedict FSC (born John Wenceslaus Edward Lidinsky), who virtually single-handedly managed the DLSAA from the ‘60s to the late ‘80s. 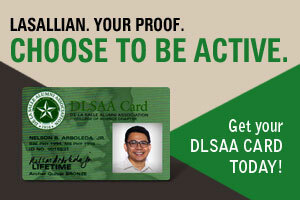 It recognizes and honors contributions by alumni to the Association or any DLSB-PD school or organization. Honorees must have rendered volunteer, unpaid, consistent, and dedicated service.